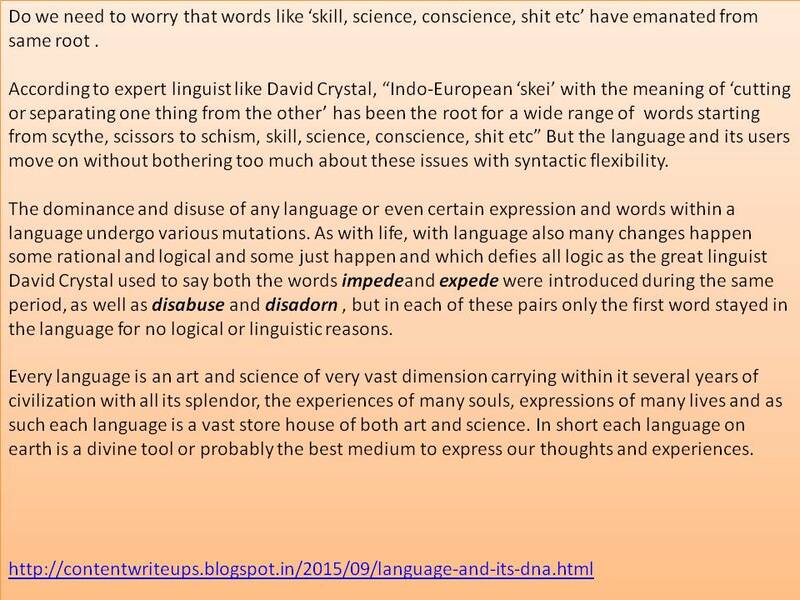 Languages get their strength from their DNA of certain intrinsic value not through chronology of survival. Some days ago I read an article, though a very old one, reproduced below. Of the list Hebrew and Tamil are more vibrant with lot of activities with some amount of linguistic chauvinism as well. Every word and every language is impregnated with various connotations some of which and in some cases, most of which have nothing whatsoever to do with either the semantic or linguistic aspect of the word but have a lot to do with the association that are enmeshed, engraved or that permeate into that word. For example when someone utters the word ‘mother’-to me personally it is an inexplicable living experience imbued with lots of personal emotions/feelings, interactions, events etc in my life wherein I may adore mother, love her in so many ways which no language can convey exactly including my mother tongue. So, expecting language, any language to convey too much and also expect its perennial importance, relevance is demanding too much from that language. This does not mean that we can overlook the fact that every word in every language has played an important role whatever be their survival value or importance or impact or prevalence now. However, to prolong and parade the importance of any language without intrinsically valid reasons is like keeping a person alive in ICU on ventilator. Further, as in the case of a patient in ICU, deprived of life’s vital energy and force to make voluntary functions with awareness, most languages too lose their vitality when some very vital aspect of either life, culture, philosophy etc that was associated with that language get diluted or disappear leading to the very utility of that language or comparatively reduced relevance of that language. This vital aspect of every language is it soul which can never die and it is the duty of linguist to unearth and learn the inherent wonders interred in those languages. The greatness of any language is not determined by the chronology of its existence but by the intrinsic contribution it has made to the various facets of /aspects of the evolution of life. To make it more appropriate the Tamil in Tiruvasakam and the Tamil in the present day Gana songs [it at all one can call them songs and also think that it is in Tamil] of Tamil Movies. 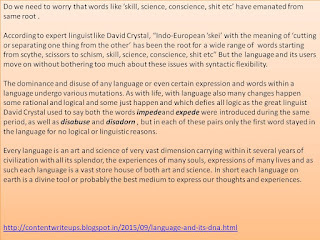 Everything has some intrinsic aspect as part of its DNA and language is no exception. If we do not like it we can ignore them but we need not damage, destroy, demean, consign all aspects of that tradition to flames but continue to call it by that same label, as for example people offer during dasara/ navarathri festival very nice China made plastic betal leaf with small Kunkum box [ in some cases with even powdered red plastic particles inside] who is trying to fool whom? I only hope and wish the sundals/dhals are not in plastic. Similarly very strict religiously principled and disciplined life styles, free, tolerant debates on important concepts of life, inquiry into the meaning and purpose of life, great works of imagination in literature etc with all of which Sanskrit was associated started giving way to the material pursuits and well being rather than entertaining the luxury of enlightened discussion and debates about soul, spirit etc the importance of Sanskrit got reduced; Tamil , though fortunately very live has also lost its sheen when its vast literature on spiritualism [what we call AANMIGAM] was assiduously given a step motherly treatment. Among the many problems faced by Hindus is finding appropriate English terminology for Sanskrit terms. This is important for those who seek to understand, practice and transmit their tradition outside of India. This is not always an easy matter, and appropriate substitutes are often difficult to find. Sometimes one has to be content with selecting from a number of imperfect alternatives, and careful thought has to be exercised when all the choices are inadequate. Some English terms are more advantageous than others. They become the means by which our beliefs are represented to people outside our tradition as well as to a new generation of English-speaking Hindus. The term murti is familiar to all Hindus and is used to indicate the various representations of God in our temples and homes. Perhaps the most widely used English term to translate murti is idol. I often shudder when I hear a Hindu guide, giving a temple tour to a visitor, describing the murtis on the altar or in the sanctum as idols. The problem is that this term is commonly used today to indicate something which is false and untrue. In the West, still deeply influenced by the views of the Judeo-Christian tradition, the term has a specific religious connotation. An idol is a false God, and idolatry is a term of rebuke and moral disapproval. We cannot ignore that Hindus have been and continue to be condemned by many for so-called "idolatrous practices." How strange it is for us to appropriate a term to describe ourselves which others use to condemn us! Perhaps there should be a serious and concerted effort to avoid its use. The word statue is also frequently used to refer to a murti, but this has its own drawbacks. It describes a sculptured, cast or molded figure, human being or an animal. Usually it approximates to the original size of the person or animal it represents. The term image is also used in place of murti and is an accurate indication of the form which it represents. Murtis are meant to focus our minds on God. Unlike the word image, the viewer is not asked to believe that the murti is actually how God appears. The search for a suitable English rendering of murti, however, is not fruitless. I recommend the adoption of the term icon. While there is some broad usage, it is employed primarily to denote a religious representation or figure. Icons are treated with respect because they represent that which is sacred. In the popular culture of the West, the term does not resonate negatively. From icon is derived the termiconography, which literally means "writing with icons." Iconography describes one of the central purposes of murtis in the Hindu tradition. Each murti is a nonverbal statement about the nature of God. Like a scripture consisting of words, a murti communicates knowledge about the Divine, and the viewer must be equipped with the necessary skills to "read" the meaning of the murti. For example, the symbolic gestures of the murti, among others, are a visual text or theology. As Hindus continue to make the geographical transition from East to West, we cannot be indifferent or heedless about the challenges of making the linguistic transition. It is necessary to be spiritually creative in finding new words and symbols to express ourselves confidently in order to transmit our tradition to new generations.”.